One of the new things we offer now is modular remote control. In the process of designing the Power Functions RC system we did a mapping of different RC functionalities. This mapping formed the basis of the Power Functions RC protocol and most of this is build into the Power Functions RC Receiver. The RC Handset launched now provides direct ‘bang-bang’ control, but the RC Receiver supports much more functionality like PWM speed control and single pin operation. Now that the Power Functions elements are available at the LEGO Shop online we have decided to release the Power Functions RC protocol as open source. 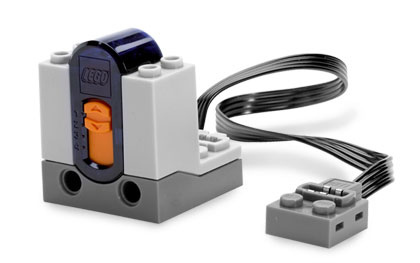 Please feel free to use any information from the protocol document for personal, non-commercial use only, provided you keep intact copyright, trademarks and other proprietary rights of the LEGO Company – have fun. You can download the protocol document as a PDF, kindly hosted by the good people of Hispalug. So, bang-bang vs PWM is like on-off vs variable? Thats nifty. I wonder how you load the software on the devices? they don’t have a USB port or anything. When I look at the IR remote is doesn’t feel like it has enough throw to support that sort of feature. Meh, I guess I should go read. Pardon my second post but, can anyone else open the PDF? Running the latest acrobat but it’s telling me the file is invalid. Its my brothers birthday in a few weeks and he desperatly wants one of these power function things, problem is though we now live in turkey. Does anybody happen to know any websites that sell these (or something similar) that would ship to turkey. I have spent hours looking but cant find anything but really dont know where to atually look for stuff like this. Any help would be really appreciated.